The following email was sent to me this morning. It’s from councillor Shahed Ali, the former deputy leader of the Respect group and the soon-to-be ex-Labour member for Whitechapel. He was one of the four Labour councillors who have effectively expelled themselves from the party to join Lutfur Rahman’s cabinet. He now pockets an extra £13,000 a year from our wallets for talking about “environment” matters. How can an independent candidate with a proven track record of breaking party rules possibly be in a stronger position to lobby for the people of the East End? Lutfur Rahman has been a Respect collaborator disguised within Labour. Wow. Pretty strong stuff. No wonder Lutfur didn’t take up Shahed’s initial offer to “work with him” late last year. In today’s letter, he tries to justify his decision to “advise Lutfur”. He also says he’s “not breaking party rules” – unlike Lutfur, of course… . Curiously, he also cites as a justification his own decision several Labour councillors around the country advising Independent mayors. Are there any examples of Labour councillors working with Independents who have been expelled from Labour? I don’t know, can someone please let me know. He also defends those useless, invisible, overpaid Tower Hamlets Enforcement Officers (THEOs), weirdly by claiming that because they are employed by the council (earning £35,000 a year each), they are somehow more effective than full blown police officers. That’s worrying. Anyway, here’s Shahed’s rather long, but intriguing letter today. I am sorry to learn you are disappointed at my decision to provide advice to Mayor Rahman as a member of the council. Having primarily been elected to a four-year term, my first and foremost priority must be with the electorate of my ward and of course the borough as a whole. 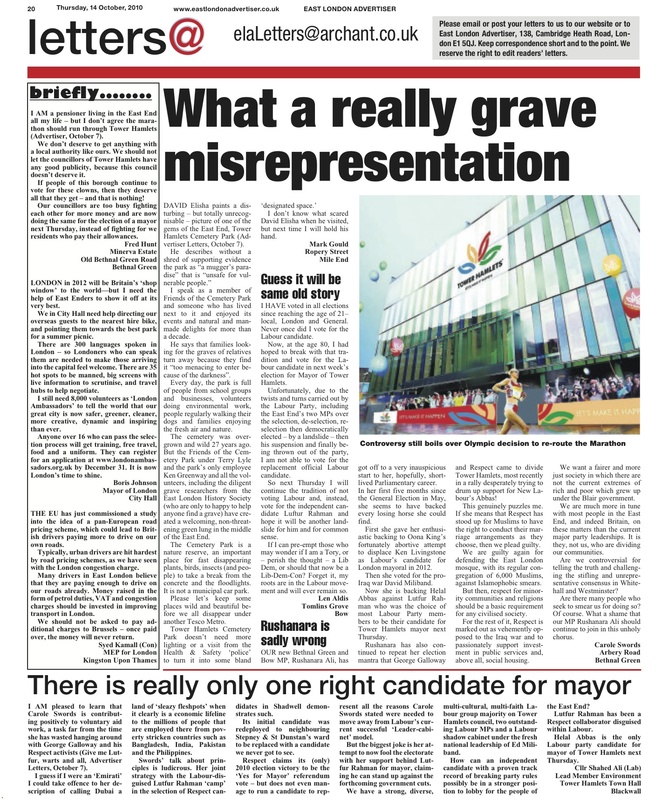 I believe that we will be in a better position to influence decisions that will practically make the lives of our residents better by being fully-serving pro-active councillors who strive to deliver demanding aspirations, rather than just pander to opposing the Mayor merely for the sake of opposition. I believe this would not be a first. Labour councillors advise in the cabinets of Independent Mayors across the country and there is nothing sinister in their passion to do anything other than to deliver for their constituents. Likewise, the case in our borough should not be any different, although I would have grave reservations about serving along with the Tories? This leads me into the fact that I am not happy with the way in which the Labour group in Tower Hamlets is now seen as being extremely ‘pally’ and cooperative with its group leader Peter Golds and the local conservative party. I was not happy with the outcome of our group AGM. As a second-term councillor and former serving cabinet member, this experience would have enabled me to carry out positive pieces of scrutiny work. However, the leader advised us all at group that a decision was made not to give SRA [Special Responsibility Allowances] positions to those of us that had chosen to disagree with the whip. I believe no such rule exists within the Labour party. Positions should in my opinion be judged upon ability, experience, and track record of commitment to council business. I believe this was not the case instead; positions were awarded in return for votes. For example, a group member was consistently absent from the majority of group and council meetings throughout the year. Many others who had also disagreed with the whip including our former leader, were also awarded with SRA positions? In the context of not agreeing with the whip, it is unfair not to apply this directive consistently. I also stood for the executive position of ‘Media and Communications officer’, competing against the then and current who was seeking re-election. I was absolutely gobsmacked to read the annual report which in my opinion was completely fabricated. I would have expected colleagues to rightly recognise and acknowledge this to be the case? In my opinion, this member was practically invincible to the role that could have otherwise been carried out as the group Media and Communications officer, as was demonstrated by my pro-active actions. I believe thy chose to intentionally steer away so as to not upset pro-Lutfur for Mayor Supporters, and the leadership quiet happily allowed this to continue. Positions should be awarded upon merit and not otherwise. During the budget process, the Labour group amendment sought to get rid of a number of council employees (THEO’s), instead to fund police officers. I could not agree with such bizarre actions quiet simply because it should be the fundamental right of our employees to expect our council to safeguard and protect its workforce. Our employees, many being local residents, should rightly expect such support from us but instead, the leadership was attempting to destroy their livelihoods so that we could fund the Metropolitan Police force? That is the job of London Mayor Boris Johnson and the current conservative government, not Tower Hamlets Council. Furthermore as a former council employee myself and GMB shop steward, I could not possibly agree with such actions and therefore could not support this amendment. The Mayor’s budget had already agreed all other of our group amendments excluding the proposal to scrap East End Life (EEL) as a weekly publication. Speaking of such, I personally feel that in a diverse borough such as ours which is a high performing council, and is geographically located to attract a huge number of planning applications and related statutory notices, the decimation of council information to ensure our residents are effectively communicated with is imperative, especially in times of such drastic government cuts. We have some of the highest number of overcrowded households and a demanding waiting list for housing. The choice based lettings pages are crucial and need to be decimated effectively. The Mayor accepted our group savings proposal of 200K so I did not feel it appropriate to challenge the frequency of its publication when I know that residents find East End Life to be an integral communication tool. Getting this information to our residents is more important to me than the fear of Mayor Rahman using EEL as an alleged propaganda tool. Due to us being a host borough for the 2012 Olympics, we will need EEL more than ever to decimate information. For example, only this week GLA member John Biggs expressed concerns about the Olympic Route Network (ORN) running from Tower Hill to the Olympic park. This will cause huge disruptions to the daily lives of our residents and affect a range of council services such as waste collection vehicles, school runs, meals on wheels deliveries etc. We need to ensure we minimise the misery this will bring to our residents by keeping them informed at all times through medium such as EEL. It is no secret just how hard I worked to elect a Labour Mayor. My commitment was 110 per cent without a shred of doubt, regardless of the fact that our mayoral candidate was not my first choice for the job. I was against, and continue to be against a Mayoral system of governance because I believe in collective leadership. It is sad that it was our former Labour government that is responsible for such. In addition to door-to-door campaigning, I regularly wrote letters to the East London Advertiser which was regularly published and posted online, and I made regular contributions, almost religiously, to the various blogs and social network sites that were following the Labour party Mayoral selection and subsequent Election in detail. I made several appearances in live television debates which clearly did not do me any favours with the strong surge of pro-Lutfur for Mayor Supporters. This included a two-hour live televised program where all mayoral candidates were present with the exception of our Labour party candidate with me representing. I had to deal with and respond accordingly to angry phone-in callers who were extremely offended by the sensitive comments made within the ‘dossier’ submitted by our eventual mayoral candidate. I believe I was pro-active in my actions and if I may so say, extremely brave to challenge a mass television audience with the knowledge that the vast majority of our residents became disaffected with the Labour party due to the shambles of a mayoral selection process in Tower Hamlets. Having joined the Labour party in 1988, I have been an active campaigner in my local ward where I was born and brought up, and continue to live. In those early days, I spent hours stuffing envelopes and hand delivering ward meeting notices to a membership of over 400 members every month. We did not have the luxury of email, mobile phones, nor could we afford stamps to make this task easy. But I chose to contribute my time and energy because I believed in the cause and wanted to get the then Lib-Dem controlled council out. Since 1995, I also happened to work for Tower Hamlets council leading up to when I first stood for office as a councillor in 2006. Sadly, I was not selected as a Labour party candidate. I believed I was much more deserving than the chosen candidates due to the time and energy I had contributed over fifteen years. The membership also plummeted due to anger over the Iraq war. The assault on civil liberties also lost us grassroots support, allowing fringe parties such as Respect to thrive, of which I also became a beneficiary by winning my seat on the council with a clear majority of 350+ votes to my nearest contender. Yes I felt happy to win but I was equally sad not to have won as a Labour party candidate to which I felt my DNA was woven into its very fabric. I wholeheartedly appreciate the fact that I was accepted to be re-admitted to the Labour party two years later, and I believe I have served my council with passion and commitment. I decided to give up my ten-year full-time employment in social services to become a councillor because I genuinely believe that under the correct leadership, we can deliver so much to our residents. I had to resign from my job to qualify as a candidate so I could have ended up with the loss of both my employment and aspiration to serve as a councillor in Tower Hamlets. I want people to be inspired by our policies, motivated by our local and national leaders and for our younger generations to become positively involved with politics. Ousting this destructive government of cuts that has affected our residents more than in other parts of the country has to be our priority but equally, I believe I have a duty to play my role in softening the burden placed upon our residents by being in a position to deliver council services at best in the current climate. These challenges are not helped by the latest actions of our CLP chair Graham Taylor. In his other role as Chair of Governors at Bethnal Green Technology College (BGTC), he has played a pro-active role in moving BGTC to becoming an Academy when the Labour group position is clearly against. I am disappointed that our leadership has done nothing to make Graham either reconsider his position, or to distance the party away from Graham’s position. This I believe will bring grave consequences for the local Labour party in forthcoming elections. I am personally heart-broken that our council’s multi-million pound asset that has just also had over twenty million pounds of BSF investment is on its way out of local authority control. To add further insult to injury, the governing body consists of parent governors not even living in our borough, yet making decisions about our borough assets. It is obvious that having won two parliamentary seats and increasing our majority to forty one Labour councillors in May 2010, we can only blame ourselves for losing the mayoral election only a mere five months later. At the time of writing, five councillors in total have already pledged to advise Mayor Rahman, and others will follow suit if the NEC believes it should just simply brush under the carpet the reasons why we are in this situation here at Tower Hamlets. I do not want to see the day when we lose the majority of Labour councillors in 2014 but unless the local party can be pulled back to the proper left, the presence of the Labour party majority here will be jeopardised. I am a Labour party councillor, and contrary to various accusations, I have not left to defect to another political party. I feel it is in the interests of all councillors to cooperate for our residents if given the opportunity. This will enable us to deliver more for our residents, and would also enable us to scrutinise Mayor Rahman’s work closely. Of course it would be ideal to have a Labour Mayor in charge of our borough, and nothing would please me more, but in the present moment, we have to make the best of an unfortunate situation foremost in the best interests of our residents. We must also remember that we have the GLA elections in the horizon, and winning back a Labour Mayor for London must be our utmost priority. That is where we should be dedicating our energy. My reading of Clause 13.X.1 of the Labour party’s rules gives me the understanding that it was designed to provide guidance to Labour groups that operate with a council leader and cabinet model. Tower Hamlets council now operates with a Directly Elected Mayor model and therefore, I do not find this clause relevant in this case. My offer to provide advice to Mayor Rahman does not determine the political control, or management of this local authority. In fact, as an example, the Overview and Scrutiny Committee of the council provides advice to which the Mayor can either choose to accept of decline. I see no major difference in any councillor providing such advice, to which the Mayor can equally choose to accept or decline. Mayor Rahman does not belong to any other political party, and I have not joined any other political party and do not wish to do so. Other councils have serving Labour councillors advising Independent elected Mayors in their respective councils so why the distinction with Tower Hamlets? I trust that the Labour party operates consistently with all its members, and as such, it will not be necessary to bring formal disciplinary action to all its councillors offering advice to Independent Mayors at the various councils they choose to operate within around the country.